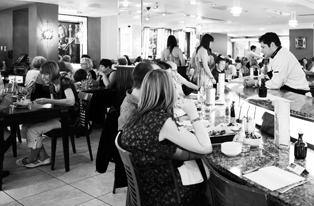 Why is Il Forno Liverpools most admired Italian restaurant? We know that delicious food should be at the heart of life - and we settle for nothing less. With outstanding modern and classic Italian dishes, we offer something for everyone. Our ingredients are sourced from the finest Italian growers. Our chefs prepare each dish using only authentic recipes and skills, fresh for you each day - and bursting with passion and flavour. From its sun-drenched farmhouses, fields and vineyards, we bring you a taste of the true Italy. Mitten in Liverpool italienische Atmosphäre und gutes italienisches Essen, Gute Weinauswahl! I had you recommended by a friend, who praised you to the sky. The food and service lived up to our expectations. Good food. Very anoying with that kind of musical entertainment when you want to enoy your food. A discrete pianoplayer would probably be nice, but POP MUSIC??? Lowers the standard of the restaurant. We had guests over from Italy and decide to bring them to il Forno as we had heard great thing about the food. IL Forno leverer alltid, god mat og god service. Denne søndagskvelden var det også dempet levende musikk som skapte en herlig atmosfære. IL Forno er en restaurant du vender tilbake til. A lovely meal and wonderful service, as always. Thank you very much. We having been coming to this resturant for many years and have never been disappointed. The sharing plata is always a favourite for me and my husband. Delicious food beautifully presented and excellent service. Thankyou for a lovely evening & fine dining service. At Il forno the staff are extremely attentive to the table, ensuring everything is okay for you. The food is delicious. My favourate place to come for steak as it is cooked to perfection every time. the meal and the service was very good but i am never happy when a restaurant adds onto the bill a gratuity charge,this should be at the customers discretion. Great atmosphere ; food quality excellent; best Italian in Liverpool. I thought it was a lovely restaurant with very good food and attentive staff. Lovely experience as always , service very good . We were having a night out for a group of work colleagues and the food and service was excellent, one of the guest who hadn’t been here before was so impressed they booked a meal for her 50th birthday for the family.